I received the big news on July 2nd, 2008. The doctor came into my colonoscopy exam room and told me that the biopsy they took during a sigmoidoscopy exam two days earlier came back positive for cancer. Not the kind of news you want to hear after they have just administered some drugs into your system via I.V. I met with the surgeon on July 8th and he said that the CT scans showed that the cancer had already moved into my Liver also. It was official, I had Stage 4 Colon Cancer. I had the malignant tumor removed from my colon on July 31st. I had a 2nd colon surgery on Sept. 18th(our 9th wedding anniversary) to fix the colon as it had collapsed. I did 16 rounds of chemotherapy. Many of the tumors shrunk or disappeared. I had liver surgery in July of 2009. They removed 70% of my liver. The remaining part had two tumors still on it. After recovering from the surgery, I then went back on chemotherapy to shrink the 2 tumors and prepare for a 2nd liver surgery. This blog has been created to keep friends and family updated as I take on this challenge. I really appreciate all the love, support and prayers for Karen, the boys and me. For those of you with morbid curiosity, below are the scars so far to my chest and abdomen(Oct. 2008). 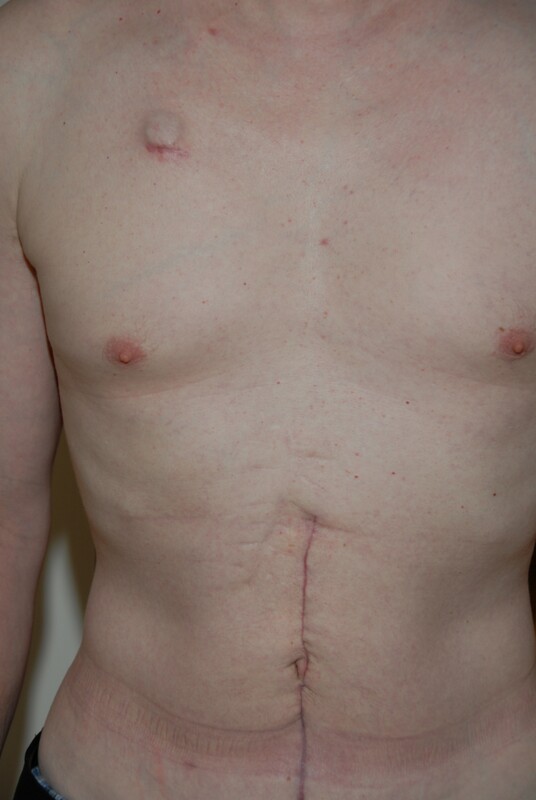 The bump on the upper left area of the chest is the Port. They access the Port with a needle each time I do chemo. The Port has a tube connected to it which feeds into a vein in my neck. The tube is easiest to see by a red bump right below my neck. The red line on my abdomen of course is from both of the colon surgeries. The first surgery scar was all below my belly button. Now the scar extends about 2-3″ up and around the belly button. He essentially went right over the top of the old scar. The faint scar to the left of the red line is my scar from when I was a week old. During my first week of life I already was in trouble with the doctors as the pyloric valve on top of my stomach wasn’t open, so that scar has grown with me for 40 years. Not sure why they haven’t just added a zipper to me yet, it would be a whole lot easier. Chris passed away on March 15th, 2011 at about 6:05 in the morning. Both his parents(Darrell and Karen), his brother(Dave), his father-in-law (Chuck) and his wife(Karen) were by his side as he left this world for Heaven. He had gone into a hospice house for about two weeks prior to his passing after the doctors had told him his liver was failing and he only had days to a couple of weeks to live. He left a huge hole in our lives and in our hearts and we miss him every day. He was buried at Acacia Park Cemetery in Mendota Heights, MN on March 19th in the Walnut section of the park. We still try to update the blog as our lives continue without Chris. I am an ex co-worker of Dianne’s at Mayo Clinic. My husband and I will be praying for you, Chris and your entire family. We are friends of Michelle King (Texas) and she has kept us up-to-date on your needs and progress. I am encouraged by your words on your blog previous to your surgery and want you to know that other brothers & sisters in Christ from our church are praying for you daily. Our family is currently on vacation in Mexico, but we feel fortunate we could still follow your progress via internet. And no matter where any of us are, the Holy Spirit provides us with the power to be with you there and to continue to pray for you. Praying on expecting great things! Just a short note to let you know that you are in our thoughts and prayers. God’s grace is incredibly available at each moment of the day and for that reason we can praise Him. May His arms surround and support you. I’m working on new murals for Eagan High School and really miss working with you. I just wanted you to know that I’m thinking about you, praying for you and your family, and wish you a very speedy recovery. I cant tell you how relieved I am knowing that you are finally home! We miss you! Don’t worry, we’re behaving fairly well without our fearless leader around! Take care, and know we are thinking about you constantly. You do not know me but I am Beth Gould’s mom Pam. I hope it helps to know that there are people you do not know who are senting thoughts and prayers your way. You can do this Chris. My prayers and my love to both of you. I will keep looking at the blog now that I know about it to get the updates, as I don’t get to see Karen too often. Karen you keep up that good attitude, and you both can beat this in the bud. Thinking of you! Sending warm healing thoughts and prayers! You may not remember me, but my mom (Gloria)and your mom are first cousins so I guess we are 2nd or 3rd cousins or something like that. The moms were just together this last weekend. I remember my sister Julie and I playing with you and Rhonda when we were all little kids. I’ve been hearing about you a lot recently and just want you to know that you are in my thoughts and prayers. With the huge family we come from, if everyone just offered one little prayer for you, you will be cured for sure! Hang in there and keep fighting!!!!! But with so many people wanting to help Chris I thought I would let you know of a small way to do so! The Marathons of Hope is Saturday the 6th at Lake Calhoun at 9 A.M. This Saturday!! This is a pledge to raise crucial funds for the PARK NICOLLET’S quality medical and support services. (this is where Chris is getting his valuable care from) you can ride,walk, roller blade in CELEBRATION OF CHRIS! More information: parknicollet.com/marathonsofhope or call(952-993-0384) Chris, I will be there Saturday riding in Celebration of you !!!. The Baty Family is always in my thoughts and prayers.! Good morning Chris. I hope you had a good weekend and got plenty of rest. I also hope school is going great for the little one’s! Thinking of you! I am Beth Gould’s sister Amy. We are praying for you and your family. Best wishes and hopes for you. We are praying for you all down here in Atlanta. Dave has kept us up to date via e-mail over the past few days. We attended church with Dave and Jill before they moved. Hey Chris, My family is praying for you. I hope that God blesses you in a special way through this process. Hi Chris! So glad that you have had a great time with your family the past couple of weeks. I will be thinking of you as you start a new round of chemo. My family recently participated in Purple Ride. It was a 20-50 mile bike ride to raise money and awareness for pancreatic cancer. My brother in law lost his father a little over a year ago to pancreatic cancer. I had you in mind that day. So many people have been touched by cancer, it blows me away. You have a wonderful support system. Take care in the coming days as you restart chemo. Much love. I wonder if we could get you in the 2009 Colondar? Those calendar photos really are amazing. Thanks for sharing you scars…the photo almost tells it’s own battle story. I found out your news from Laurie and I’ve been keeping an eye on your blog through out your journey. We had cancer come into our family a few years back -I truly think your positive attitude, faith, and all the love and support you have will pull you through. My husband, Andy has been running in the “Get your Rear in Gear” race for a few years, I’ll have him join your team! Finally, albeit accidentally, latched on to your blog. My goodness what a journey you have been on. Your smile and humor is great, an example for all of us. I keep up on stuff happening on your end via Bette and Doris. Our prayers and best wishes for you as the journey unfolds. Chris, your latest entry is awesome and inspiring. What a testimony to prayer and being open to what God has in store. A Vessel. Cheri just sent me your update. I sent you a previous reply but I don’t see it-you must not have received it. What a beautiful testimony! God will take good care of us when we are called to him. Stay strong with your healing as we pray for you and your family. Does Kathleen know about your illness? Have you heard from her? Let me know if you have. I’m so glad you have such wonderful beauty in your life. What a fantastic network of family, friends, church and our Lord. Anyone who reads your blog is blessed by your strong faith and love for Jesus. What a powerful witness you have and how much God is Glorified in your trial. My kids and I are praying for you all. We are praying that God’s Will be done for only He knows what is best for us. Chris and Karen you and your family are in my prayers. Chris, Karen and boys, it is with heavy heart to hear of this news. You must know how I cherished working with you and pray for you at this time. Chris you sound like you have peace in your heart and what a precious LOVE for your family. Karen may you find comfort knowing of such an incredible inspiration Chris is to you. I love you both and thinking of all of you at this time. Chris, I don’t know if you remember me from Proex, but I sure remember you. I just found out yesterday about the struggles you have had the past few years and my heart just sank. You on the other hand seem to be at peace with everything. I will be honest and tell you I don’t know what to say, but all I have thought of since I read your blog yesterday is you and your family. I will pray for you and especially your wife and kids. Chris, we have all been so blessed to have had you in our lives. Working with you was always a great time. Your strength, faith and words of peace are a beautiful guide for the rest of us on how to focus on what is important in our time here on earth. 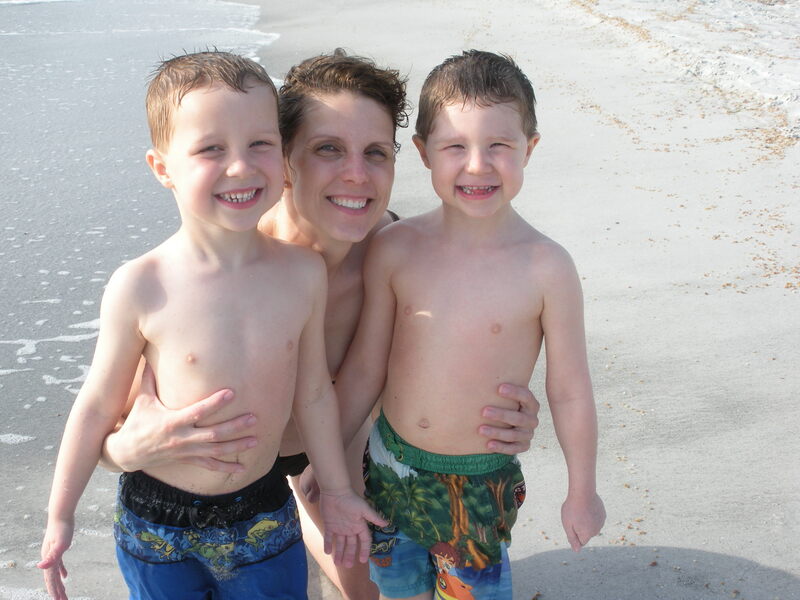 God Bless you, Karen and your two little guys. Hi Chris and family, I worked with Chris at Proex, I wanted to say hello, it has been a long time. Remembering the fun times working at Proex with you and the old crew makes me smile. You and your family will be in my prayers. Many have put into words better what I could say. Just know my thoughts are with you and yours. We continue to pray for you and love you very much! Please write or call any time … Just wanted to let yo know that!! you are very special people and God loves you very much!! May He give you peace that is far more than we can imagine! Karen, just heard the news yesterday of Chris’s passing, so sorry for your loss! The world has lost a great man, husband, father. He will be missed by many. You are very blessed Karen, I pray for your continued strength & strong faith.